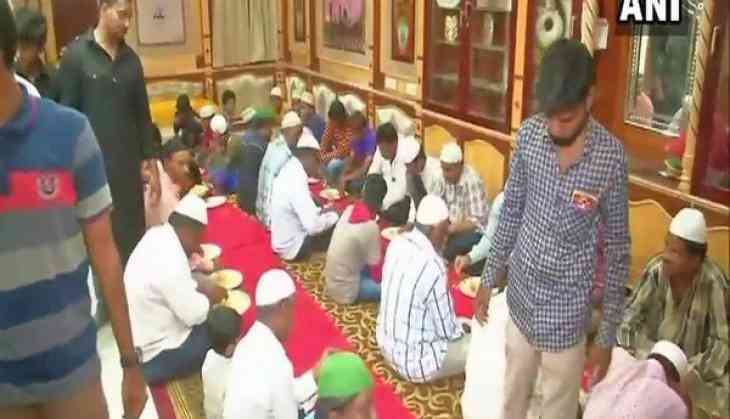 A non-profitable trust in Hyderabad, Zaheer Uddin Khan Memorial Trust serves Iftar to more than 500 poor people daily and distributs ration to over one thousand poor families who can't afford it. Mohammad Azhar, member of Zaheer Uddin Khan Memorial Trust said, "In this month of Ramzan we serve food for Iftar to poor people including children from poor families who can't afford it. They come here after their Roza (Fast) and eat. More than 500 poor people visit here daily to consume food. We serve food for all 30 days". "Our trust also distributes ration to over1000 poor families in Ramzan. We provide all this help from our own income," Azhar told ANI. Mohammad Shafi Ulla, a beneficiary of the trust, said, "It's very appreciative that they distribute ration to so many families, even I and my family receive ration from this trust and we also come here to consume Iftar food daily during the month of Ramzan."